Commercial truck drivers spend long hours on the road, often working under grueling conditions that can lead to an increased risk of serious accidents. When a truck accident does happen, the results can be absolutely catastrophic—particularly for the drivers and passengers in the smaller, lighter weight passenger vehicles involved. After a devastating truck crash, many people often assume that the truck driver was the primary one responsible. However, that is not always the case. Trucking companies are required to follow the rules regulating the commercial trucking industry, as well as ensure the compliance of the truckers who drive for them. When trucking companies fail to uphold this responsibility, they may be liable for the accidents, injuries, and deaths that occur as a result. If you were seriously injured—or lost a loved one—in a truck accident caused by truck driver or trucking company negligence, you may be eligible to seek a financial award for damages. Here is what you need to be sure you receive all of the compensation to which you are entitled. More than 4,300 large trucks and buses were involved in fatal crashes in 2015, which represents an 8 percent increase from the previous year. In 2015, there were approximately 415,000 police-reported crashes involving large commercial trucks, 83,000 of which resulted in injuries. The number of large truck crashes that resulted in injuries increased 62 percent from 2009 to 2015. Only 16 percent of the people killed in truck accidents in 2015 were truck occupants, compared to 69 percent who were passenger vehicle occupants and 15 percent who were motorcyclists, pedestrians, or bicyclists. Negligent hiring practices. When a trucking company hires a new driver, it is responsible for ensuring that the new hire has a valid commercial driver's license (CDL), as well as a clean driving record. Failing to verify a trucker's CDL or perform a background check could allow drivers with suspended or revoked licenses—or a history of alcohol or drug use behind the wheel—to slip through the cracks. 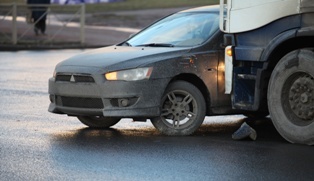 If these commercial drivers cause a truck accident, the company they drive for could potentially be liable for damages. Inadequate training. Trucking companies are also expected to provide their drivers with the training they need to operate their vehicles safely. If they fail to do so, they may be considered partially at fault for accidents, injuries, and deaths that their inadequately trained drivers cause. Deficient supervision. Drug tests should be part of every trucking company's hiring process. The company should also randomly test their drivers for drug use whenever they have reason to suspect that the trucker may be abusing drugs. Hours of Service violations. The Federal Motor Carrier Safety Administration (FMCSA) regulates the commercial truck industry for safety. In an effort to reduce accidents, injuries, and fatalities involving large trucks, the FMCSA implemented Hours of Service rules that limit driving and work time, and mandate rest periods. If trucking companies encourage their drivers to work or driver longer than allowed, they could be held responsible for the accidents that occur. Insufficient or improper truck maintenance. FMCSA regulations also require commercial drivers to inspect their vehicles at the beginning and end of each shift. However, if the trucking company fails to repair reported problems, or allows unqualified employees to make the repairs, they could be held liable for any accidents caused by a lack of maintenance. Do You Need an Experienced Truck Accident Attorney? If you were seriously injured in a truck accident that occurred as a result of truck driver or trucking company negligence, you may be eligible for compensation. The knowledgeable truck accident attorneys with the Morris James Personal Injury Group can help you seek a financial award from any and all liable parties. Contact the Morris James Personal Injury Group today to schedule a free, no-obligation initial consultation.